Why do they do it? Some people are just stupid. Ex US Marine Matthew S. Andrews is one of them . . . stealing my entire web server data and then attempting to blackmail me. The guy’s an idiot! All I can say is that people who are stupid generally get what they deserve eventually. I didn’t just threaten Mr Andrews that I would blog about his blackmail attempt if he didn’t do the honourable thing – I promised him that I would, but now he even WANTS me to “blog away kid” as he puts it . . . so here’s the post! These are the details of this extraordinary exchange that I had with a computer technician Matthew S. Andrews and my commentary for what it’s worth. 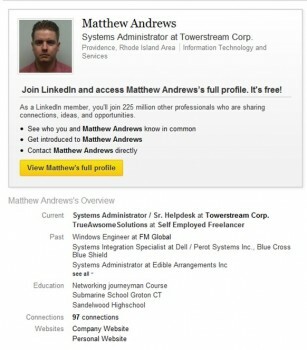 For his families sake I hope his employer doesn’t ever Google: “Matthew S. Andrews“. He’s unlikely to remain in that employment very long if they do. I did the first so that should the websites have any changes done to them after the investigation began, that I or anyone else that wanted it could refer back to the actual snapshots. There are alternatives such as The Wayback Machine (www.archive.org) but archives can be removed and the US courts have not always accepted this data as evidence. Copies taken by a third party however and stored, with witnesses that the data is valid at a certain time however ARE usable in evidence in any jurisdiction around the world. I did the second so that should anyone want to get nasty, I would have a good up-to-date backup of my server in place that I could restore from. So, step one was to log the job on Freelancer.com – a website connecting freelance technicians and so on with technical work such as that which I sought. I opened an account at Freelancer, posted the job and then accepted Matthew’s bid. He spoke happily on Skype. His Linked In profile showed a reasonable track record and skillset. He responded with an offer within bugdet and I paid him his requested deposit. He took quite a while to complete the first task but that didn’t bother me so much, I just rolled with the punches, but when he didn’t show much knowledge of how to do the second task and time was running out for me, I subcontracted that to another provider. I asked Matthew how many hours he had spent on the work and finally got a reply that he had spent eight hours and thus I owed him for three hours. No problem but he never filed his report hours on Freelancer nor put in a payment request via PayPal so I couldn’t pay him. He never sent an invoice either. I simply asked that you allow me to do the work and pay me what you own, you owned 3 hours you have failed to pay. So with interested and fees its now 150 US Dollars Please. Per Pay pal you should have the pay request I anticipated this would occur so (I cloned your entire system) now you will pay up or I will provide all databases and FTP files “all 30+ sites will be provided to Daniel Evans” along with all emails and correspondences regarding this job. If you fail to pay within 12 hours I will assume you don’t care and provide all information to the site owners you had me copy and monitor, along with all emails and requests, freelancer job etc. And yes I have a copy of every site and database you had on that server. I am will provide it to your competitor if you fail to pay the 150$ within 12 hours. Not really negotiable so a response is not needed. Simply pay the project close out fee and I will delete all traces of your data. I think you might be misunderstanding a few things, so please, let me highlight them for you . . .
1. I requested the backup of his websites. You did that for me, thank you. I’ve already done the backing up of my own server as I couldn’t wait for you to research how to RSYNC to a web-based backup service. 2. When you go through the proper channels and place the three additional hours over the deposit paid, then I will pay you. Freelander.com is the proper channel. You didn’t do that for the first 5 hours but I do now require that you do it for the last three. 3. We entered into a contract. This was that you would do the job and I would pay you at an agreed rate. Changing this contract unilaterally is called Breach of Contract. If you attempt to proceed with this Breach of Contract I will class your account in dispute and will not pay you until you return your claim to the agreed rate and I will then pay you the remaining 3 hours, as we originally agreed. 4. I understand from you that you are a professional for a long time in the IT industry and that you have previously spent time in the US Forces. I’m sure that you would understand then very well that your threats, are unprofessional and attempted international blackmail. 5. For the record all but one of the websites are mine, my wife’s or my friends’ and pretty much all the data is fully visible on the Internet. Doing what you threaten has little impact on me. Check all the URLs buddy. I am calling your bluff. Daniel Evans is not a competitor. He is a businessman whom I know very well who I am investigating. I wanted a backup of HIS websites not to hide anythign on my server from him! I think that you have chosen to blackmail the wrong guy. May I suggest that you research what I do when people do bad things to me. I don’t often sue them but I reserve the right to. I don’t over-react. I give them a chance to fix the problem prefessionally, respectfully. If they don’t and they p*ss me off I blog about them. I share the facts – the history, the facts and my commentary. Every single one of them, bar none has regreted their actions, some even begging me to remove the post. I never do, although I always respect their right of reply, even if that sometimes makes things worse for themselves. NFWAB! Matthew my friend, may I suggest that you take 5, reconsider your threatened course of action and do the honourable thing. How about using the system the right way and get your extra 3x hours pay the right way? I’m not holding out on you. Remember that I paid you in advance even outside of the Freelancer system? I have never had any intent other than to pay you for what you did but you must seek payment through the right channels first. My promise is that should you forward any data that does not belong to you to a third party, I will blog about you, your performance in completing the task, all your communications with me including this one, details of your theft and blackmail attempt and I will put my commentary along side of the facts. I also reserve the right to have you charged with any crime like extortion or attempted blackmail, Breach of Contract, theft or anything else the lawyers in your state would like to hit you with. I don’t care what you think about me or what I say but if you go ahead with what you threaten Matthew I promise you that you will make even more of a fool of yourself than you currently have. > Not really negotiable so a response is not needed. As I said, go to Freelancer, log your three hours and I will pay you. I updated freelancer with the 3 hours. I am honorable but feel cheated. 3 hours is what i was not paied, so your correct 3 hours is what i should get. Please remit payment via freelancer, and then cancel the project please as its set for 10 hours until 10 hours is payed via freelancer it will stay open until that is payed so you have to cancel it. OK, so many would have buckled for fear of losing their data, and coughed up to a greedy, abusive, aggressive, loser who somehow wasn’t intending to ‘black male’, even though he did and still could do for he has the data for all I know! BUT we are agreed on some things . . . PayPal via Freelancer is the correct payment mechanism and three hours is the “correct” amount he should get paid for. I don’t know why he feels cheated when he acknowledges that in the same sentence that three hours is the right amount, but hey people can sometimes feel something without obvious logic or reason, except to themselves. Anyone who’s been married knows THAT challenge, for sure! An hour later though, Mr Brightspark has another bright idea – why not release the stolen data anyway, just invite me to blog about himself, report me to Freelancer (when he has already bypassed their payment systems and attempts this again) AND then write off the debt all at the same time? [9:53:41 AM] Matthew S. Andrews: I think that you have chosen to blackmail the wrong guy. May I suggest that you research what I do when people do bad things to me. I don’t often sue them but I reserve the right to. I don’t over-react. I give them a chance to fix the problem prefessionally, respectfully. If they don’t and they p*ss me off I blog about them. I share the facts – the history, the facts and my commentary. Every single one of them, bar none has regreted their actions, some even begging me to remove the post. I never do, although I always respect their right of reply, even if that sometimes makes things worse for themselves. NFWAB! [9:54:26 AM] Matthew S. Andrews: really your going to blog about me regarding what to whom? And have fun suing me in your 3rd world country…. I am contracting freelancer now to report you. This right here is integrity and honor keep you money. And threaten me again see what happens to your preciousness systems. OMG! Is this guy for real? Sir, a contract is entered into when two people agree. We agreed the work, the rate; the payment terms and conditions. A unilateral change to that agreement is called a Breach of Contract. We had it in writing but even a verbal agreement is legally binding. I will blog about you, your performance in completing the task, all your communications with me including this one, details of your theft and blackmail attempt and I will put my commentary along side of the facts. Obtaining a copy of a website for the purposes of obtaining a backup for potential litigation or dispute resolution is not illegal sir, not is it “borader illegal”! I didn’t say I was good friends, I said I knew him very well. Your assumptions have been wrong – first that he’s a competitor then that he’s my “good friend”. No – neither. I asked you not to browse the website directly so that your IP was not visible in the website logs FOR YOUR OWN PROTECTION so that you could be an anonymous subcontractor – obviously not a very important factor to you at the end of the day! Integrity and Honour? I contracted a small security job to you and instead of doing the work and keeping it confidential (for your own sake) you chose to expose my investigation to the company being investigated? It’s a moot point though because considering that the entire investigation is and will be VERY public, methinks you have got it very wrong! Breaking the law in the USA has nothing to do with a third world country, sir. Attempted blackmail is attempted blackmail anywhere around the world. One phone call or email to any lawyer in your State and you would be toast, I’m sure! The attitude that people can’t or won’t sue you because they live in a far off land or don’t have the resources of those around you will likely cause you serious issues if someone did choose to litigate against you. Your claim that the job is fake at Freelancer.com is only partially true, sir. The job was never processed in the normal manner because you initiated a request for payment by PayPal, thereby shortcircuiting their payment systems and denying them of their rightful income. Anyone who does this is liable under Freelancer’s terms of trade. You may wish to consider this when dealing with them and perhaps hope that they do not ‘discuss’ the matter with you. Here is the evidence of your request, my payment and your acceptance. Per Pay pal you – you mean PayPal? the pay request I anticipated – you meant to start a new sentence sir? and correspondences– you mean “correspondence” (which is already plural)? I am will provide – you mean “I will provide”? not paied, – you mean paid? I am contracting – “contacting” you mean? I was not intending to black male, – blackmail? regreted – a spelling mistake. Sorry! Freelander.com is the proper channel – oops! A typo. Sorry! Sorry ex US Marine, Matthew S. Andrews . . . I will be careful when I write from now on. It is wise to assess your opposition when in a conflict situation and avoid conflict when you can. I DO NOT respond well to attempted blackmail sir, and when people steal from me do not take the opportunity to rectify the situation but make it worse, I will ALWAYS share this experience with the world. ALWAYS. Please remember, NFWAB. In regards to any threat, as I said before, I PROMISED to blog if you acted unprofessionally. It was not a threat, it was a promise. You have INVITED me to “blog away kid” which I have now done. Trust Mr Andrews takes a long time to develop and can be destroyed in seconds. I do not believe that anyone should ever trust you again for anything in the IT world. That you would even consider doing what you have threatened to do is unconsionable and anyone entrusting digital data to you in the future would be totally NUTS! That you actually follow through with that (or at least claim to do that) is more than a breach of trust. You have only yourself to blame when the world finds out that you are unworthy to be trusted, which I am sure in due course they will. Anything adverse relating to any data stolen from my server will be traceable right back to you and your retention of my data. Any DDOS attacks; any hacking attacks; any security breach – ANYTHING will very likely incur a visit from the authorities to you and analysis of YOUR activities for you are now shown to have motive, proven capcity to steal (you confessed that to me twice) AND to act unethically. I think you’re crazy! I accept your offer for me to keep my money. I will consider it recompense for the three hours writing a 3,500 word blog post about you. Again, I reserve the right to sue you – stealing data and/or distributing it without my permission is sir, more than a breach of trust – it is a crime. I hope for your sake that when your children grow up and Google their father “Matthew S. Andrews” that they you can all handle it well because that too will surely happen. You always have the right of reply. I suggest again that if you ever read this blog that you take 5, think carefully about what you have done and are doing, then respond in a professional manner. Lastly, you may not realise it but Outlook analyses your performance the same as I do: matthewsandrews1@yahoo.com “failed our fraud detection checks”. Oops! To others reading this post, I caution you in regards to this dude. 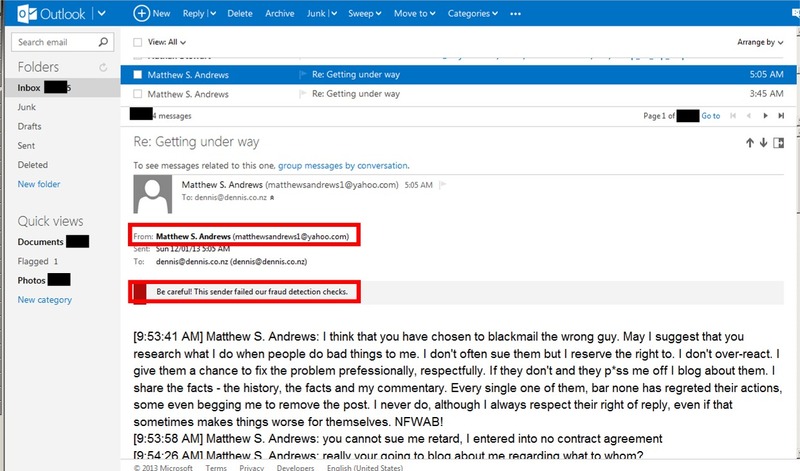 Clearly a “Weetbix short of a breakfast” that Matthew S. Andrews has the capacity to attempt extortion and blackmail, then to act vindictively when confronted about his ‘black male’ attempt does not bode well for people engaging with him professionally. You have been warned! Please note: I DO NOT go out of my way to hurt people. I HAVE NOT contacted his employer to ‘dob him in’, nor have I contacted Freelancer to report him and I WILL NOT initiate any of this, but I DO speak the truth and make commentary on people who rip me off and don’t do the right thing to recitfy matters when given the chance to. Enjoy your day people. Maybe it got off to a better start than mine, but no matter the case, the sun keeps on smiling at us!